Please contact me regarding the 2012 Roller Bed Trailer Conversion Permanent System - Listing# 149419 for sale at TruckerToTrucker.com. Take a look at this 2012 Roller Bed Trailer Conversion Permanent System. It is Listing# 149419 at TruckerToTrucker.com. KieTek provides Trailer Roller Bed Systems in threeversions: Permanent, Drop In, and Fold Up. 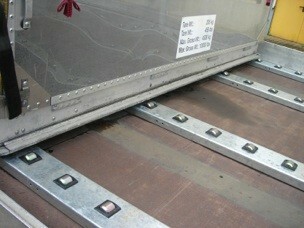 The Permanent is plank that is installed to the floor of a trailer. KieTek provides the plank in a kit form with roller cubes and retainers. Even though it is considered a permanent system this product is still easy to transfer to other trialers. All of our systems are maintenance free which saves your time and money from running your truck for the phneumatic system to work.